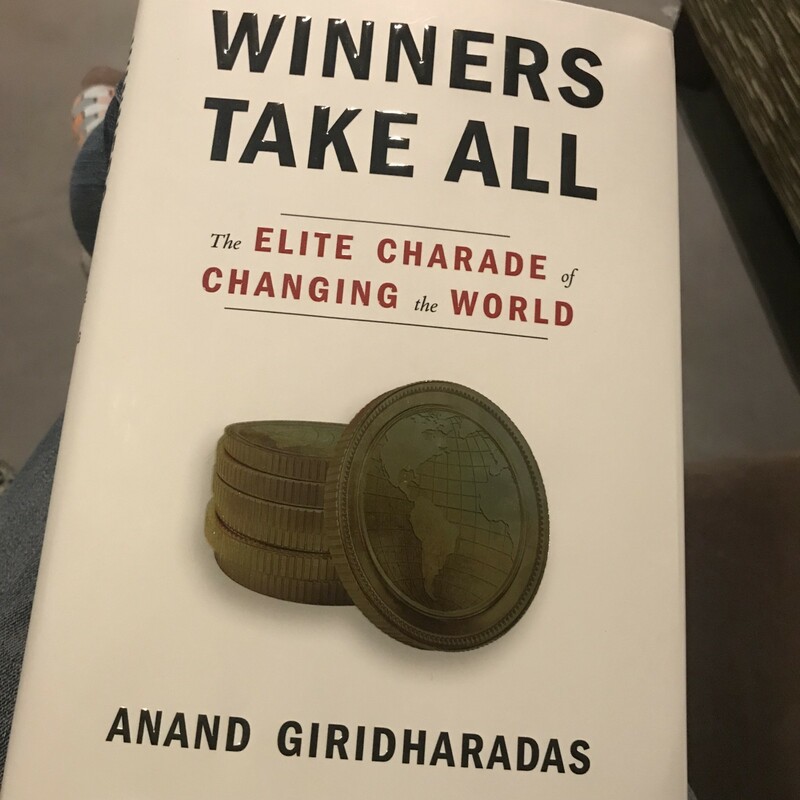 Winners Take All —Anand Giridharadas and the structural failure of “win-win” as a way of thinking about the world’s problems. It was 2015 when there was quite some public debate going on in Europe about TTIP, the Transatlantic Trade and Investment Partnership in the making. Strangely enough in my circles of green and social entrepreneurs no one really talked about it. Which was odd, because the negative consequences of trade agreements like TTIP (and later CETA) on the environment and on equality were potentially massive. So that’s why me and a couple of other entrepreneurs decided it was time to raise our voices. We called ourselves Today’s Entrepreneurs (Ondernemers van Nu) and we took a critical stance towards handing over even more power to multinational companies, and towards ongoing environmental degradation and socioeconomic inequality. We got some traction with our initiative, and our petition for a new economy was signed by slightly over a thousand (mainly small) companies. There were actually a hand full of bigger businesses who openly spoke out against TTIP (like Lush and Patagonia), but overall we experienced a lot of hesitation and indifference. Turns out that structural change was just not a priority for businesses who were busy saving the world. It got even more bewildering to see that companies like Unilever, DSM, and Danone were actively promoting TTIP, while at the same time their CEOs — and thus the companies themselves — were lauded as climate heroes, Champions of the Earth, or global leaders for sustainability. Something was clearly not right, it seemed like there was a blind spot for many in seeing the links between cause and effect. That same year I was invited to Summit at Sea, a conference organized by Summit, that promoted itself as curating ‘the brightest people in business and culture for a voyage across international waters, culminating at an uninhabited island in the Bahamas’. As one of the few Europeans invited this felt like a great opportunity to learn more about the mindset and culture of the people who would shape the future of America (and the world for that matter). My curiosity in the end was stronger than my objections in terms of money and environmental effects. Besides, I had vague plans to organize something similar in the European Alps, so it felt like a great way to get inspired and shape ideas. — so off I went. Once there, besides meeting a lot of amazing people and going to great sessions, what struck me was the praise for speakers like Eric Schmidt (Google) or Travis Kalanick (Uber), people who were at the time already controversial but to whom not a critical word was uttered by the moderators on stage. Also, not a single word about trade agreements during the whole conference, the topic I was so busy with at the time. Slightly disappointing, but revealing too. Slowly — it took me some years — it appeared to me that in this culture of disruptive start-ups, Instagram influencers, change making app-developers, millionaire investors, generous philanthropists and top athletes there was much room for personal development, for spirituality (Kundalini! ), artistic expression (John Legend! ), and improving relationships (Esther Perel! ), but little for more critical notes, at least not when it comes to questioning the structures our wealth is built on — and these trade agreements are part of — and the victims of our collective western lifestyle: the environment and the have-nots. Now, early 2019, where are we now? On the one hand I feel a tipping point is near. An increasing number of people starts to see that what got us in to the mess is not getting us out. It is not enough to simply green our consumption patterns, to give to charity, or to develop an app that makes it easier and cheaper to get at taxi. It’s not enough to have a great idea, preferably an idea that ‘impacts millions of lives’, give a TED talk about it and feel good about it. A great example of my prudent optimism is a short video shot during the World Economic Forum that went viral. In the clip Dutch historian Rutger Bregman pointed out how ridiculous it actually is that a bunch of billionaires can decide how to tackle climate change and inequality. Billionaires who in the first place all fly into Davos by private jet. How abject is it that Bono can teach some Zimbabwean minister about debt relief, and how everyone praises each other’s foundations, instead of tackling the real issue: tax benefits for the rich. Although I agree with Rutger and his proposed solution (pay more tax!) it’s of course easy to bash billionaires. I mean, how many of them do we know personally? It’s facile to blame people you don’t know. But what if those billionaires are only the tip of the iceberg? What if the issue is much bigger than those 1,500 billionaires in Davos? What if all those 3,000 participants of Summit at Sea are the problem? What if it’s you and me? Then it would be a different ball game. And that is exactly what Anand Giridharadas talks about in his book Winners Take All — The Elite Charade of Changing the World. In his view the current billionaires are part of a culture, a culture with its own convictions, habits, rules, language, a culture that is part of what he calls ‘marketworld’. This parallel world consists of affluent do-gooders who believe that it’s absolutely fine — and possible — making good money while saving the world. The mentality in marketworld of ‘doing good by doing well’ in his eyes is not working, because it does not address the underlying causes of the problems we see in the real world. Giridharadas’ stance is that the elite is willing to change the world as long as it benefits them. This basically means that the current economic system is not at stake here. We’re not talking about systems change, we’re talking about maintaining the status quo, a system essentially based on oppression and exploitation. In the book he makes a compelling case that the culture of marketworld has found its way to many of today’s popular and leading conferences, institutions, and business communities. Part of it is the idea that the market is better at solving the world’s problems than governments can do. But not only that, part of this culture is also that we now have ‘thought leaders’ instead of ‘critics’. At TED talks we don’t use certain words, we talk about ‘opportunity’ instead of ‘inequality’, since our stories are more effective when they’re polished and positive, and when they concern individuals, not systems. Integral part of marketworld, according to Giridharadas, and therefore of this new culture of ‘winners’ are next to the usual plutocratic billionaire philanthropists (Michael Dell, the Sackler family) for example consultancy firms or banks like McKinsey and Goldman Sachs, The B-Corporations, the Burning Man, TED, SXWS and Summit communities, The Aspen Institute, the World Economic Forum, the Silicon Valley molochs, the Clinton Foundation; what all these communities have in common is a rock steady belief in the market. And it would be okay if marketworld was really solving today’s crises, but the fact of the matter is: they’re not. And again: the reason is they’re not looking at the underlying root causes of today’s crises. This does not mean that the intentions of marketworld people are necessarily bad of course. And yet, just when I want to end this article on a positive note, I get a newsletter in my mailbox. It’s Summit, praising former Starbucks CEO Howard Schultz — who also happens to be a billionaire - for his considering to become an independent presidential candidate. Perhaps it’s time for Rutger Bregman to be invited on stage this year? If anyone truly believes that the same ski-town conferences and fellowship programs, the same politicians and policies, the same entrepreneurs and social businesses, the same campaign donors, the same thought leaders, the same consulting firms and protocols, the same philanthropists and reformed Goldman Sachs executives, the same win-wins and doing-well-by-doing-good initiatives and private solutions to public problems that had promised grandly, if superficially, to change the world — if anyone thinks that the Market-World complex of people and institutions and ideas that failed to prevent this mess een as it harped on making a difference, and whose neglect fueled populism’s flames, is also the solution, wake them up by tapping them, gently, with this book.